The original, most experienced provider of secure parking and storage for semis, tractor-trailers and commercial vehicles in Phoenix, Arizona. Security Truck Park is the pioneer provider of parking for your tractor-trailer, truck trailer, intermodal container, fleets and other commercial equipment. We are a family business with over 55 years combined experience in the parking, storage, drop yard, warehousing and transportation industry. We are proud to serve customers from large companies to owner/operators. From Canada to the United States and Mexico, Security Truck Park provides secure commercial parking and storage solutions for thousands of trucks each year. We proudly accept many forms of payment and stand out above our competitors to maintain an A+ Better Business Bureau rating, We pride ourselves on having a great relationship with our customers. 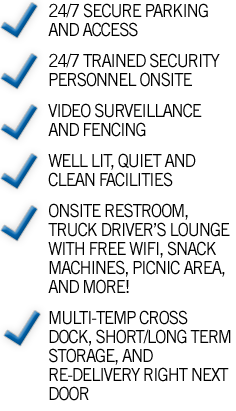 Security Truck Park can accommodate semis, tractor-trailers, manufactured homes, commercial equipment, automobiles, portable containers and any other fleet parking needs you may have. Security Truck Park of Arizona is the most centrally located secure parking and commercial storage lot in Phoenix, Arizona. Our facility is located just minutes from the I-10 and I-17 interstates and across the street from the Maricopa County Sheriff's office.